A week in the south Lakes with a toddler saw us frequenting a series of farms, aquaria and other outdoor activities. While natives of the area might have declined to join us on the basis that it was too cold or too wet, our enthusiasm remained, ahem, undampened. We spent some time feeding the ducks in the Grange duck pond. The toddler grew tired of that pretty quickly, preferring first to people watch and then charge around the garden with a stick. After a while of “stick, stick, tree, tree” we decided it was time for a quiet sit down. S Café advertises itself as selling the best coffee in Grange ‘or your money back’. Grange does have quite a few coffee houses, so this is no mean claim. We didn’t have the time to conduct a comprehensive survey but can report that S Café’s coffee is pretty good. 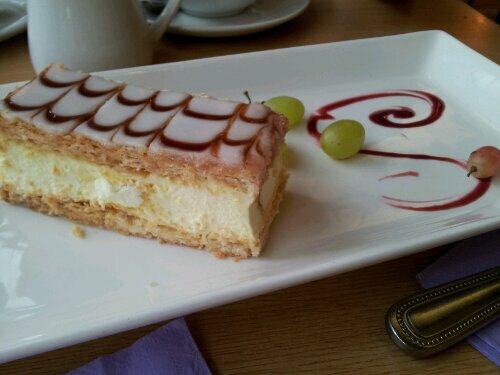 Its coffee cake is also excellent, the vanilla slice rates as acceptable, while the shortbread is best described as poor (soggy and crumbly rather than super short and crumbly). 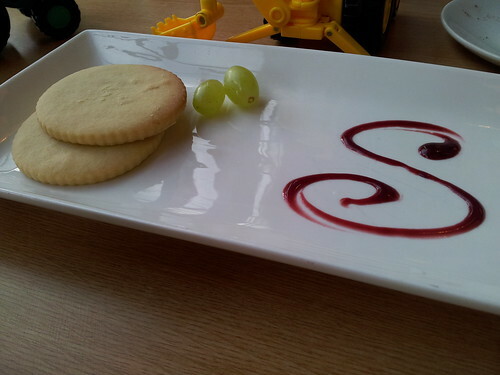 The cakes were all served beautifully presented – with grapes (‘hello grapes!’ said the toddler, ‘pshaw shortbread!’) and a swirly S in raspberry. Where things go wrong in S Café is the service. The lady who served me had clearly chosen the wrong career. A more dour demeanour I couldn’t have managed myself. At least I would have got the order right … When I asked for an Americano she queried whether I wanted milk (no) and yet she brought out a cappucino (printed docket as aide-memoire clearly no use). She then returned with an Americano – with milk. Why bother asking? S Café did score quite highly on the child friendly front – while no one in the UK seems to be able to make a froth dominant babycino, S Café did have a generous selection of children’s toys to entertain younger patrons.